If I said the terms kaizen, 5S, and visual workplace, you would probably think of manufacturing. These concepts have been used in leading manufacturing plants around the industrialized world for years. 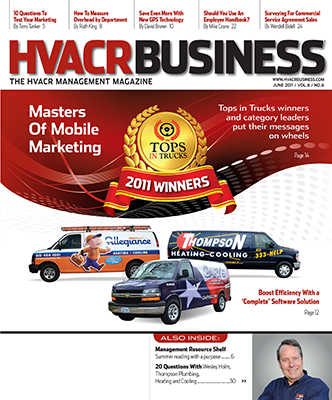 Did you know, though, that these concepts could help improve your hvacr business? If you are skeptical, consider the story of Angie Alvarado, a district general manager for Sears Product and Parts Repair in Sacramento. This complete story, which is all about trucks, is available for download in the DOWNLOAD CENTER courtesy of Gwendolyn D. Galsworth, a consultant and visuality expert who worked with Alvarado and wrote Visual Workplace: Visual Thinking (Visual Lean Enterprise Press, 2005). There are plenty of photos and specific examples of visual improvements. Here’s a synopsis of the results of the improvements the service team made: revenues increased $1.5 million in a year, customer satisfaction went up 300 basis points in the same year, and reschedules and cancellations dropped by 28,000. Within two years, the Sacramento unit became No. 1 in the nation, climbing from 47th place out of 67 Sears service units. It’s hard to boil Galsworth’s concepts and methods down into one written column, but Alvarado does a great job in her testimony. Basically, Sears wanted to improve the productivity of its service teams because, as with most businesses, it was having to get more done with fewer resources. It was observed that the team members spent time looking for information, tools, and equipment in their trucks, which was time taken away from interacting with customers and concentrating on service. But instead of issuing standardized solutions for simply “being more organized,” the Sears unit allowed each technician to revamp his or her truck however desired, with a goal of making information, tools, and equipment have a designated location and label (Galsworth calls these “home addresses”). This effort at the Sears unit was about more than cleaning up sloppy truck cabs. It was about recognizing that each technician possessed the ability to make improvements and that the most valuable place to make these improvement was the workspace— literally where value is delivered to the customer. It was about ownership and self-improvement as well. 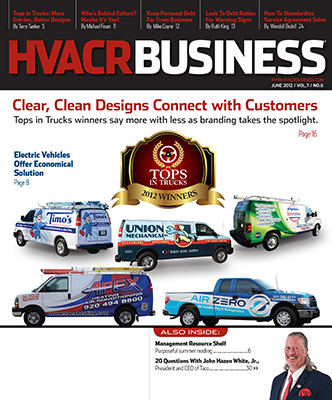 Morale soared, according to Alvarado, and productivity went up 15% because technicians were freer to interact with customers, recommending additional services and providing better follow-up. And, from what Alvarado says, it made the workplace a more pleasant place. The power of visuality is that it empowers employees to do their jobs more efficiently based on their own evaluations, ideas, and actions. It seems with this concept, everyone benefits, especially customers.